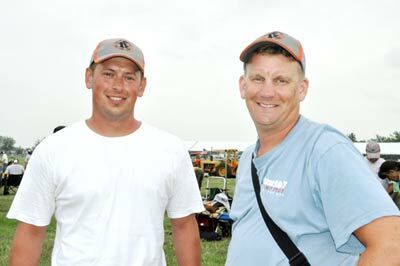 CAMP PERRY, OHIO – Mike Barranco and Mike Miller were winners at the 2011 National Vintage Sniper Rifle Team Match, but if you ask around, so were the other 284 shooters that made up the remaining 142 two-person teams in the first match of its kind at Camp Perry. 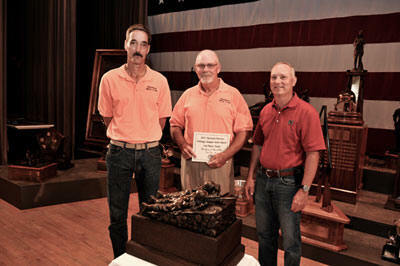 Mike Barranco, left, and Mike Miller, middle, on stage with Dave Emary, of Hornady, with the new Vintage Sniper Rifle Team Trophy, which was donated to the CMP’s National Trophy collection by Hornady. Barranco, 46, of Irvine, California, and Miller, 64, of Downey, California, were consistent at both 300 and 600 yards, with Barranco firing 98-3X at 300 compared to Miller’s 97-2X. At 600, both shooters fired 98-2X, giving Barranco an aggregate of 196-5X and Miller a 195-4X. Together, Mike and Mike set the bar for future matches at 391-9X. “We were shooting Mike Miller’s reproduction M1903A4 that he topped with an original Weaver 330C scope,” Barranco said. Barranco’s and Miller’s performance barely eclipsed that of Robert Steketee, 61, of Haslett, Michigan, and Thomas Dean, 57, of Perry, Michigan, who placed second with a score of 390-11X. Dennis DeMille, 46, of Oceanside, California and Glendale “Don” Rutherford, 59, of Tallapoosa, Georgia, finished third with a total score of 389-13X. 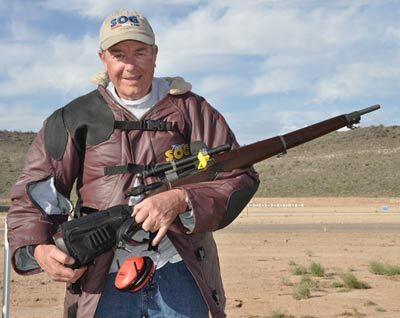 Sponsored by SOG Specialty Knives & Tools, Bob Schanen, 62, of Brookfield, Wisconsin, fired the high individual score of 197-9X in the 2011 National Vintage Sniper Rifle Team match. Schanen teamed with Dave Emary to win in the 2010 Western Games sniper rifle test match at Ben Avery Shooting Facility in Phoenix. Bob Schanen, 62, of Brookfield, Wisconsin, who fired with Jerome Van Treeck, 64, of Racine, Wisconsin, on the fourth place team, registered the high-scoring individual aggregate of the match with a 197-9X. Schanen fired 99-7X and 98-2X at 300 and 600 yards, respectively. Bret Newton, 51, of Bakersfield, California, and Ronald Wager, 52, of Atascadero, California, rounded out the top five with an aggregate of 386-14X. 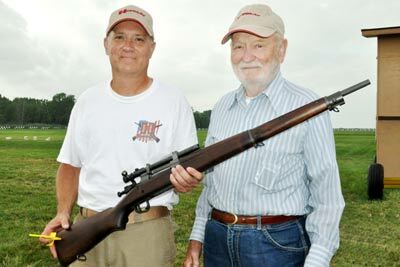 Dave Emary, chief ballistic scientist for Hornady Manufacturing, and his father Robert take a moment to reflect on the success of the first Vintage Sniper Rifle Team Match held at Camp Perry. Dave was instrumental in bringing the new match to fruition and he says his dad was his inspiration – a decorated World War II scout sniper who parachuted into Holland after the Normandy Invasion and fought all the way to the Eagle’s Nest. Gary Leginza, 47, of Livonia, Michigan, Steketee, Barranco and Douglas Armstrong, 51, of Lexington, North Carolina, each fired 196 individual scores in the match. DeMille, Thomas Torborg, 39, of Blaine, Minnesota, Robert Boxler, 48, of Akron, Ohio, and David Beebe, 52, of North Olmsted, each fired 100 in the 300-yard stage. Barranco, Miller, Schanen and Rutherford led all shooters with 98 at 600 yards. The consensus reaction to the Camp Perry version of the match from participants was “lots of fun – can’t wait until the next one.” Tested at smaller venues at last fall’s CMP Western Games and officially introduced in April at the CMP Eastern Games, the Vintage Sniper Rifle Team Match was eagerly anticipated on the Camp Perry stage. Because of the critical timing of target exposure, communication and pit service were of paramount importance. It was imperative that competitors got their targets marked and raised on command. Shooters didn’t have the advantage of automatic electric target carriers like those at Camp Butner, North Carolina, home of the Eastern Games. “I thought the match went great – for as many times the targets had to come up and down in a timely manner – I can’t believe there were not alibis. There were no range alibis – it was perfect,” said Steve Wickersham, 28, of Omaha, Nebraska. Wickersham and his teammate, Glenn Ward, 60, of Bellevue, Nebraska, shot the match for the first time at the National Matches. They were accompanied by a half dozen other shooters from the Eastern Nebraska Gun Club. Steve Wickersham and Bill Keil, both of Omaha, are members of the Eastern Nebraska Gun Club and are veteran Camp Perry shooters who were impressed by the new match. Wickersham said scoped rifles are going to bring back many vintage rifle shooters whose eyes could no longer handle open sights. Bill Keil, 40, of Omaha, Nebraska, runs the ENGC’s highpower program. Though he fired other matches during the week, he chose to observe the Vintage Sniper match so he could make notes and take them back home while watching Wickersham and Ward, he said. “Honestly, we just ran a couple of trial Vintage Sniper matches back at ENGC and I was a little leery about it, but now that we’ve seen it work, I’ll be bringing my M1D back to shoot this next year,” Keil said. Fred Gowen, 63, of North Reading, Massachusetts, and Bob Greenwood, 54, of Methuen, Massachusetts, fired the match for the first time and both were enthusiastic about the experience. “Having a format to shoot these kinds of rifles is nothing but great. You’ve (CMP) got to keep doing it. 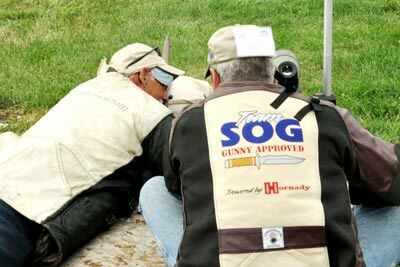 Dennis DeMille, also sponsored by SOG Specialty Knives & Tools, assists teammate Don Rutherford in the 2011 inaugural event. DeMille and Rutherford finished third in the competition. 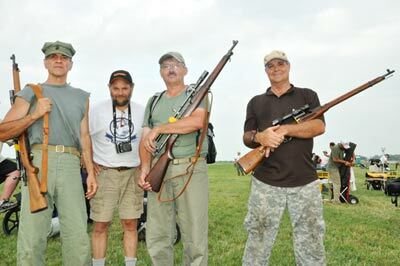 For complete results of the 2011 Vintage Sniper Rifle Team Match, log onto http://clubs.odcmp.com/cgi-bin/report_matchResult.cgi?matchID=6544. To view, download and order photos from the matches, log onto http://cmp1.zenfolio.com.